It’s the coolest ride in the neighborhood. The Dubai natives’ “micro-taxi” service that takes passengers on jaunts of about two miles or less is now operating through Shadyside, but by April their fleet will be traversing the South Side, Strip District and downtown neighborhoods as well. And in February they’ll make their debut in “almost heaven” Charleston, W.Va. Rides are free on weekends and only $5 during weekdays. Drivers, who keep the fares and tips, lease the “cabs” for $25 per day. During weekends, Autopods pays the drivers $10 per hour to accommodate for the free fares. 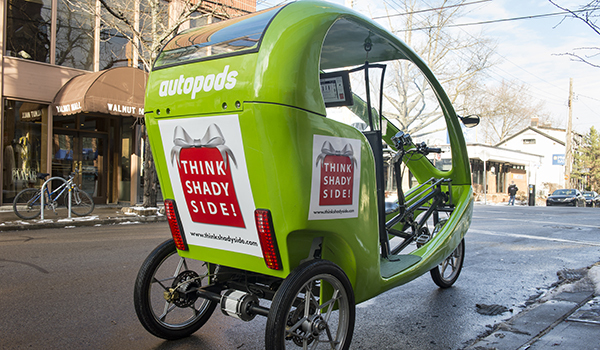 During the holiday season, Autopods partnered with the Shadyside Chamber of Commerce, which sponsored the weekend rides for shoppers. Parts of the street-legal electric bicycles are produced and assembled by six manufacturing companies in Guangdong, China, and shipped to the U.S. at a cost of about $3,500 each. But Apte and Vidhani, who took shipment of their prototype just one week after graduating last May, said they recoup the cost pretty quickly. Color exterior ads on the Autopods are $850 a month. “It’s profitable. The pods pay for themselves in less than one-and-a-half months. It all comes down to advertising,” said Apte, who thought of the idea for the company during the winter of his junior year. “It got too cold for me to walk to class so I thought if only there was a way to get a quick short distance ride — something a taxi wouldn’t do,” he said. 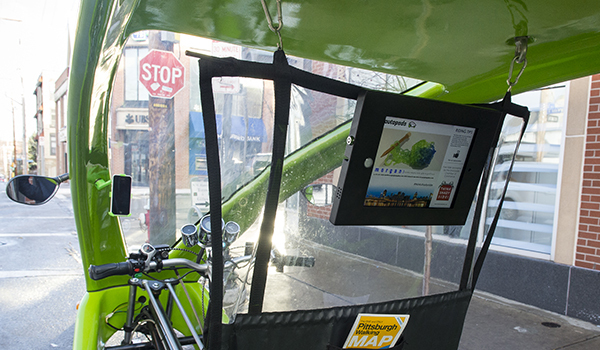 Apte, who earned his bachelor’s degree in information systems, is the CEO and handles the advertising and apps through which riders access the vehicles and view advertisements. Ads also are placed on the exterior of the taxis and companies can run video ads on an iPad that faces the back seat passengers. Businesses pay a premium to advertise. “When you see these on the streets, people’s heads turn,” Apte said. iPad video ads run $150 per month; black and white exterior ads are $650 per month; and color exterior ads are $850 per month. Rates are on a per pod basis. Mistick said the vehicles garnered a lot of attention in Shadyside. “Everyone loved them. Several chamber members thought it was very fun. When I was riding around I saw many people pointing. 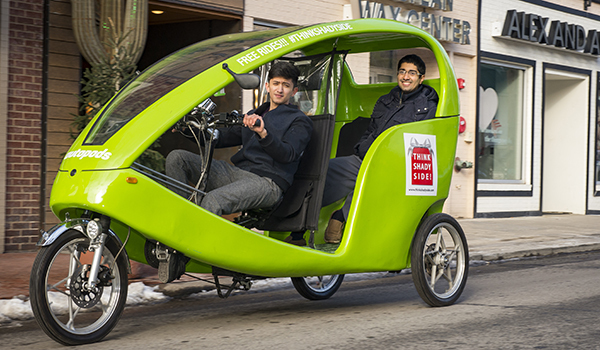 They’re great because it’s like riding in a big mobile billboard,” she said. Vidhani, who earned his master’s degree in mechanical engineering, is the COO and engineer of the company. Also on the team are Arya Tabatabai, another 2015 CMU mechanical engineering master’s degree grad, and Prashant Bhardwaj, who graduated from Arizona State in supply chain management. Tabatabai runs the product development side of the house. Modifications now underway include rolled glass and canvas jeep-like doors that snap onto the shell; a lighter aluminum shell that would cut the vehicle’s weight from 400 to 225 pounds; and iPhone mounts created by 3-D printers. Apte and Vidhani credit much of their success to the entrepreneurial culture at CMU. Passengers view video advertisements on an iPad. Apte noted several CMU courses that he found instrumental. Autopods recently received a $50,000 investment from AlphaLab Gear for a 9 percent share of the company. AlphaLab Gear is an accelerator program that helps entrepreneurs in the early stages of product and customer development. It provides startups with free office space, thousands of dollars in perks and discounts, such as free legal and accounting services, and educational programming. It also provides mentors who help startups with their business models, marketing and sales. AlphaLab Gear selects startups based on its ability to develop and launch a winning product and/or service, the technology’s market potential and the concept’s originality. “We took Autopods into the program because we believe they have an idea and underlying technology that, with the proper business model, can completely disrupt short-distance transportation, especially in the U.S.,” said Assistant Program Manager Chris Millard. “They also have a great team. Tanuj and Deepak have the perfect blend of technical talent and business smarts to makes this company successful. Like all our companies, we took them because their success means a healthy return on our investment, which goes right back into funding more of the emerging talent in this region,” Millard said.